gree of supersaturation was varied within 0.005 - 0.01.
the process was under diffusion control . 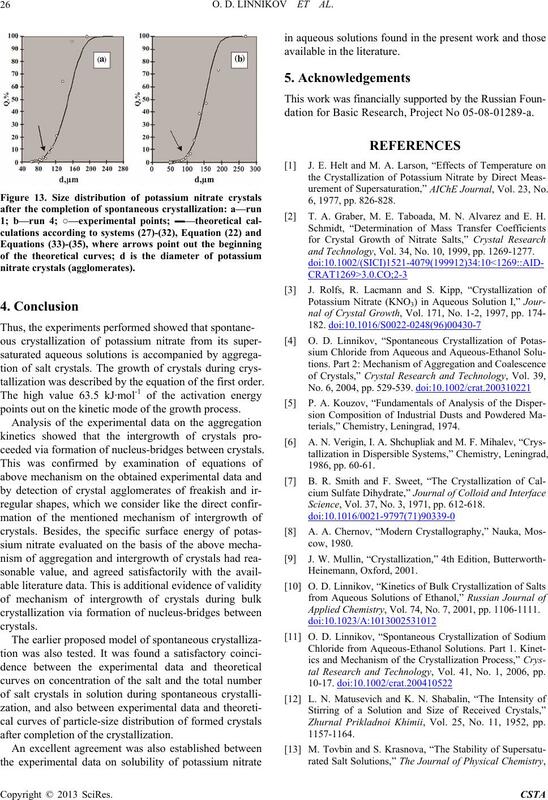 tense dispersion of the crystal growth rates was observed. flat structure; no significant objects were found. saturated solution in salt crystallization. with a glass crystallization vessel of 250 cm3 capacity. constant Kc of the salt . crystals and prevent their intergrowth during air-drying. with optical and SE microscopy. drous solid and the volume (5 ml) of samples. measured electrical conductivity was 0.2%. O. D. LINNIKOV ET AL. the spherical coefficient of salt crystals . after the crystallization was completed. 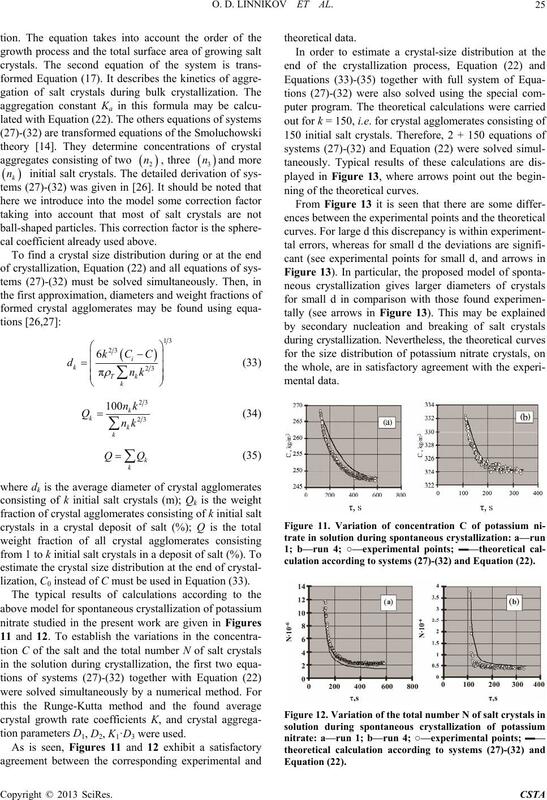 N of formed salt crystals, we obtain formula (5). 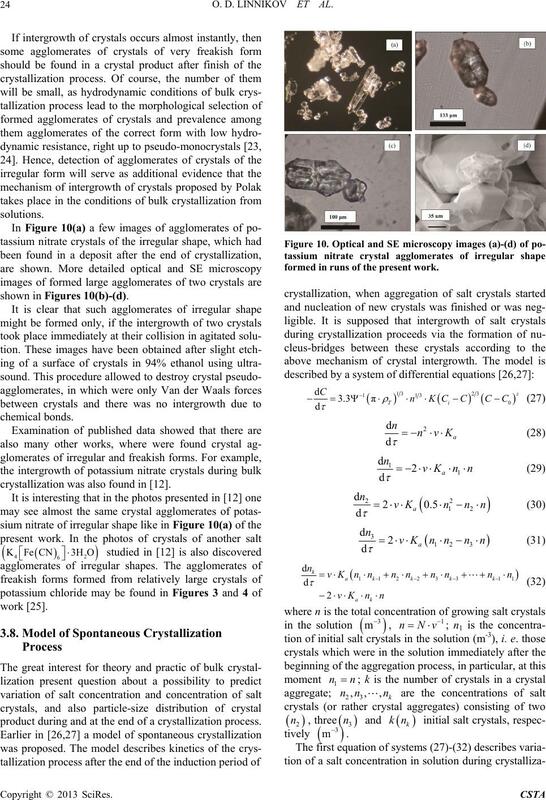 the shape of most crystals differs sharply from a sphere. sider crystals of different shapes as ball-shaped particles. Then we derive Equation (4) from expression (9). thorhombic structure. There is a following basis for this. lated value of the spherical coefficient was approximate. 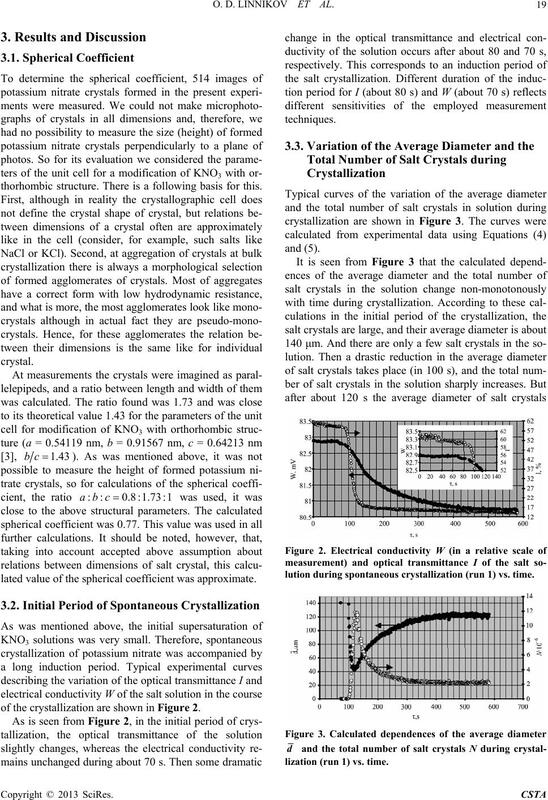 of the crystallization are shown in Figure 2.
lution during spontaneous crystallization (run 1) vs. time. lization (run 1) vs. time. tions by means of expressions (4) and (5) were incorrect. salts was observed also in [4,10]. ith formulas (4) and (5) give “true” values of d and N.
where t is the temperature (˚C). sent work was in the kinetic mode. where Ka is the aggregation constant. was performed under the condition that Ka was constant). 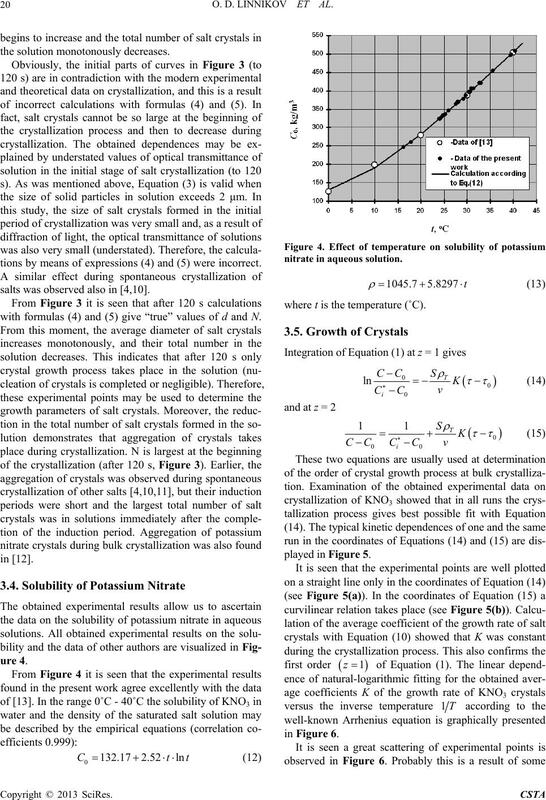 tion (17) is valid during this stage of the crystallization. 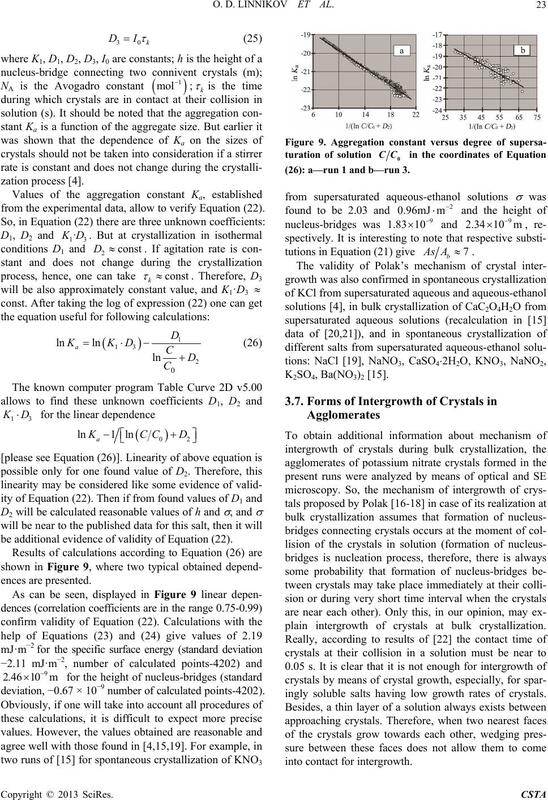 other runs and at crystallization of other salts [4,10,11]. and they should not be compared with Equation (17). nates of Equation (17) after integration. ergy (J·m‒2); a is the parameter of crystal lattice (m). connecting two connivent crystals (m). increasing when supersaturation of solution is decreasing. 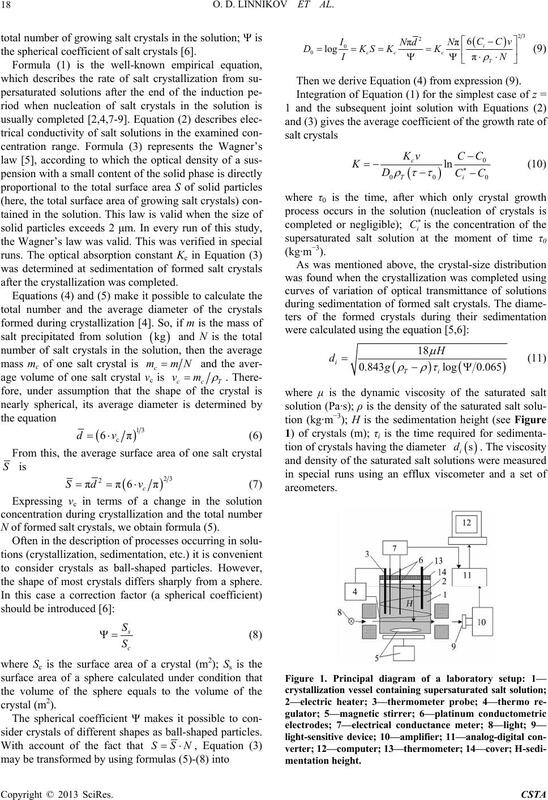  one can calculate 2.34.
cleation on surface of crystal. be additional evidence of validity of Equation (22). 0.67 × 10−9 number of calculated points-4202). 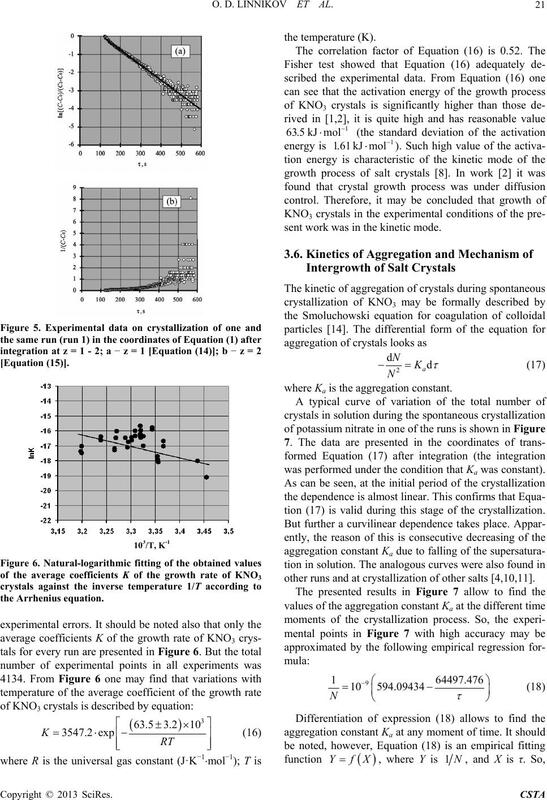 (26): a—run 1 and b—run 3.
ingly soluble salts having low growth rates of crystals. ystallization was also found in . product during and at the end of a crystallization process. formed in runs of the present work. cal coefficient already used above. lization, C0 instead of C must be used in Equation (33). ning of the theoretical curves. culation according to systems (27)-(32) and Equation (22). points out on the kinetic mode of the growth process. 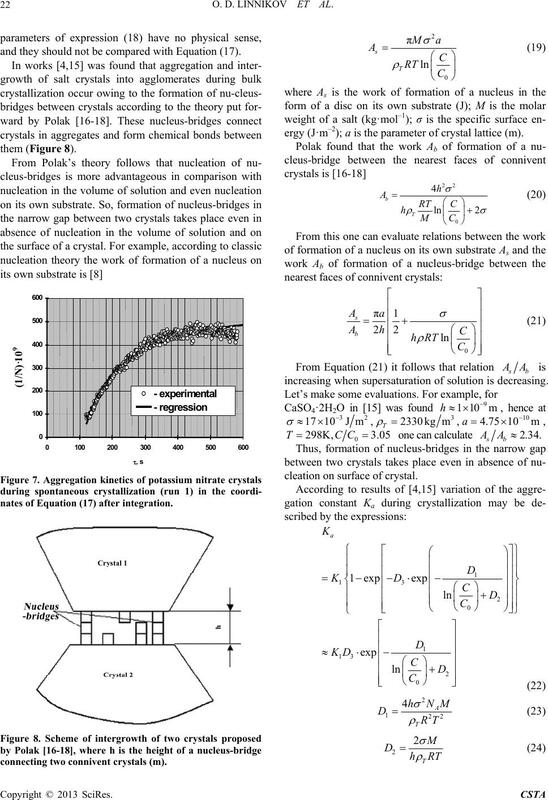 ceeded via formation of nucleus-bridges between crystals. tallization was described by the equation of the first order. after completion of the crystallization. dation for Basic Research, Project No 05-08-01289-a. 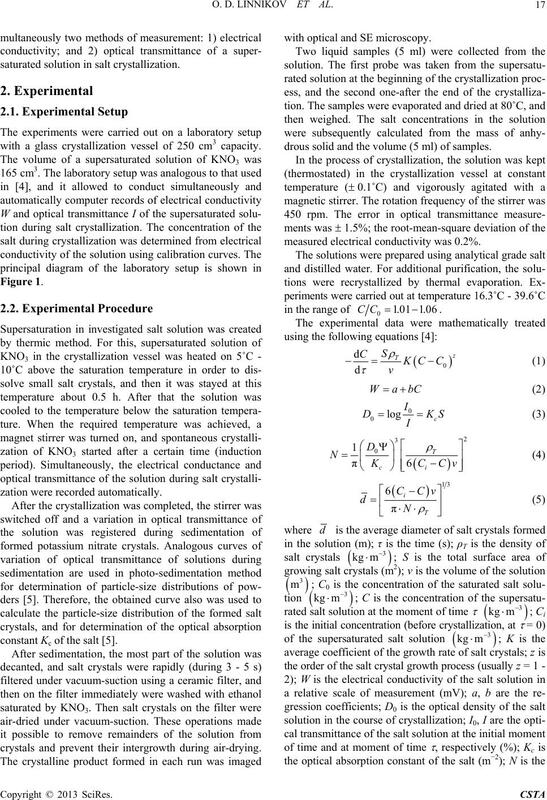 urement of Supersaturation,” AIChE Journal, Vol. 23, No. T. A. Graber, M. E. Taboada, M. N. Alvarez and E. H.
and Technology, Vol. 34, No. 10, 1999, pp. 1269-1277. Science, Vol. 37, No. 3, 1971, pp. 612-618. Applied Chemistry, Vol. 74, No. 7, 2001, pp. 1106-1111.
tal Research and Technology, Vol. 41, No. 1, 2006, pp. Zhurnal Prikladnoi Khimii, Vol. 25, No. 11, 1952, pp. Vol. 23, No. 7, 1949, pp. 863-870. 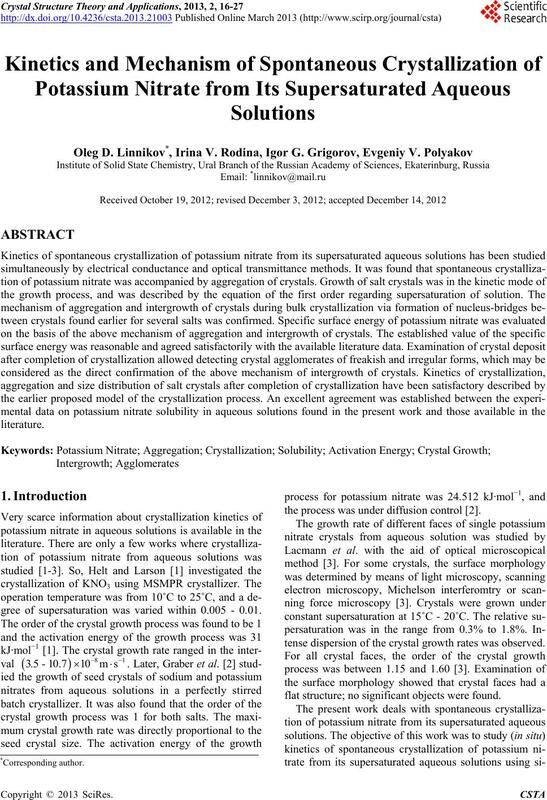 V. P. Vaganov, E. A. Amelina, R. K. Yusupov, E. D .
rate Crystals,” Colloid Journal of the USSR, Vol. 36, No. tal Research and Technology, Vol. 41, No. 2, 2006, pp. Science, Vol. 52, No. 5, 1997, pp. 747-757. Hydrodynamics and Mass Transfer in a Stirred Vessel. gineers, Vol. 50, 1972, pp. 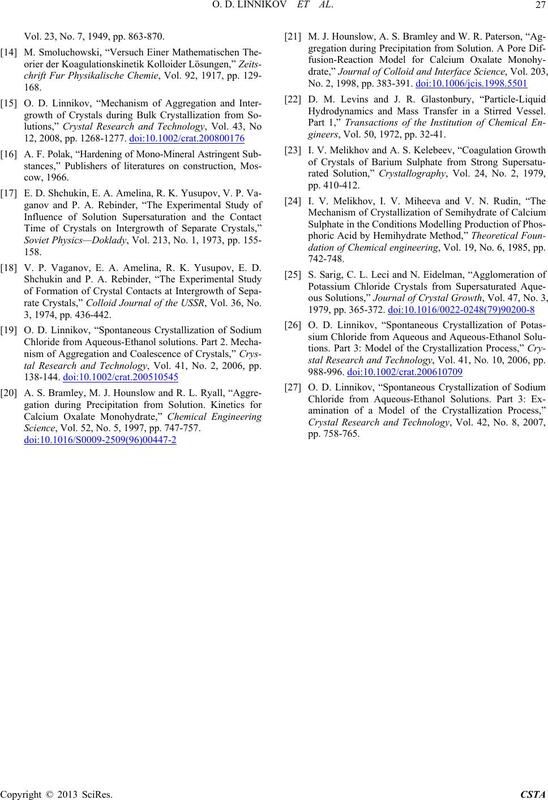 32-41.
dation of Chemical engineering, Vol. 19, No. 6, 1985, pp. stal Research and Technology, Vol. 41, No. 10, 2006, pp.